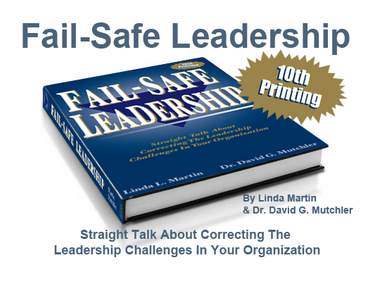 What Is Fail-Safe Leadership About? What Are People Saying About Fail-Safe Leadership? Contact us to find out how Fail-Safe Leadership can make all the difference. Dr. David G. Mutchler, President and CEO of Leadership Development Systems, LLC, a firm that provides leadership services to a wide range of businesses. He trained and consulted locally, nationally, and internationally in such industries as Information Technologies, Radio and Television, Printing, Automotive, Utilities, Construction, Engineering, Publishing, Real Estate, Packaging, Petroleum, Medical, Legal, Financial, Manufacturing, Telecommunications, Insurance, Industrial Equipment, and a host of wholesale and retail businesses. Linda L. Martin, founded Resource Associates Corporation. She spent over thirty-five years in the training and development field, personally working with clients in a wide range of business and industry, not-for-profit organizations, education, and government. Her books, manuals, programs, and processes are presently being used by hundreds of thousands of people throughout the world. In addition to writing, she contributed as a speaker and lecturer on a wide range of business and achievement issues, and personally coached many executives and business leaders.